Business writing can be a tricky thing if you don’t prepare for it. Darcy always makes sure to spend enough time with clients to ensure she and her team understand what message they are trying to convey and how they want their finished product to look. Always Write focuses mostly on blogs and websites for business clients. Below is a sample list of some of our clients, past and present. Symphony – a division of Thompson Okanagan Tourism. Darcy writes and updates Symphony’s visitor guides, and updates websites for the Similkameen Valley, North Thompson Valley and Boundary Country for several years now. She’ll also be auditing and updating the Valemount tourism website. Darcy loves EQ writing and letting people know of all the great places to visit and fun things to do in these areas. What makes it even better is she has a great team that she works with. At first, it was an easy project, update the visitor guide for the City of Vernon. Then came the website. This was not an update… it was a massive overhaul. In the end, the Tourism Vernon website was over 300 pages. We continue to update the website and the visitor guide each year. The website was such a hit the year it was launched, it won gold from Marcom Awards. If you scroll all the way down to the bottom, there’s Darcy’s name. She’s proud to have been part of this massive endeavour. We are really proud of the work we do with MSR Solutions. We’ve grown the website with valuable information that gives prospective clients the information they need to choose MSR Solutions for their water and wastewater projects. Darcy Nybo took over the reigns as editor for BC Wine Trails in March of 2018. She loves working with her great team of writers who help make the process run smoothly issue after issue. Darcy has also been the editor for Field to Plate Magazine (which became FarmFolk CityFolk’s magazine) as well as the Westside Weekly Newspaper. Tinhorn recently updated their self-guided tour and needed someone to come out, take the tour, and then write information for the signage and the brochure. Walking around a winery and tasting wine was tough, but someone had to do it! While it was a few years ago, you can still see Darcy’s handiwork on the Accelerate Okanagan website. This was a complete overhaul and rewrite of the Accelerate Okanagan website. Darcy met and liaised with the team at GoodSir as well as the team at Accelerate Okanagan to find the right voice, the right words and the right way to get the message across. In order to write effectively on a topic where most people would not be considered an expert, Darcy spent hours researching to collect the information needed to create the educational articles and the newsletters for MotorWerke. Today, MotorWerke has their own in-house writer; however, the two years she spent researching and writing about fine European cars gave her a whole new appreciation for European engineering and the passion that comes with it. Darcy had the pleasure of working with Sandra Bradshaw for many years. We did media releases, newsletters, periodical writing, case studies and created her fabulous website. Click here to see Sandra’s site. This was one of those projects where Darcy was able to use her knowledge on most topics that relate to health, alternative medicine and cutting edge technology relating to health. We also write for TCM practitioners, chiropractors, naturopaths, acupuncturists, Reiki practitioners, Feldenkrais practitioners, energy workers, master herbalists, pharmacists, dentists and more. This was at the start of Darcy’s professional career as a writer. She dove right into the deep end and was asked to interview over 100 women entrepreneurs and create biographies for them. The education she received while doing this was priceless. 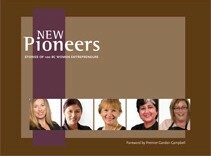 From the initial workshops to the New Pioneers book, she absorbed every business lesson possible from these women. While Darcy did the majority of the interviews, we had a great editor and proofreader working with us in order to make deadlines. You may download your own copy by clicking here. This project was Always Write’s first big break and we and eternally grateful to the Women’s Enterprise Centre for having chosen us. Here is a partial list of our clients. It gives a good sampling of the broad range of clients we welcome. Not all links go directly to work I’ve done for them.